SyncToy is a files sync software developed by Microsoft. Considering SyncToy has some shortages, here we find a free SyncToy alternative--AOMEI Backupper. Sync files can bring you a big convenience for working on different PCs. It can sync your files so that you can update the data in synchronization. SyncToy is a file sync software developed by Microsoft. It is free and it can use graphical user interface to synchronize local or network files/folders automatically and keep track of renames to files to ensure the changed folders can be synchronized. This free tool can save the sync data in multiple locations and devices. Besides, it is possible to update the information of sync files and notify it as duplicated, discontinued, or spam. However, SyncToy can’t synchronize those not WebDAV such as “Windows Mobile” files or folders. Thus, SyncToy alternative came into being. As we mentioned above, the SyncToy is a great tool designed by Microsoft, and it has a strong feature to synchronize files and folders to the different locations and devices. But it has some shortages. If you want to synchronize removale device files or folders, the SyncToy can’t help. The good news is SyncToy can be replaced by other software. The best alternate to Microsoft SyncToy could be free. AOMEI Backupper Standard, which has the strong functions beyond sync files. AOMEI File Sync has the powerful one-way function, and supports schedule sync. 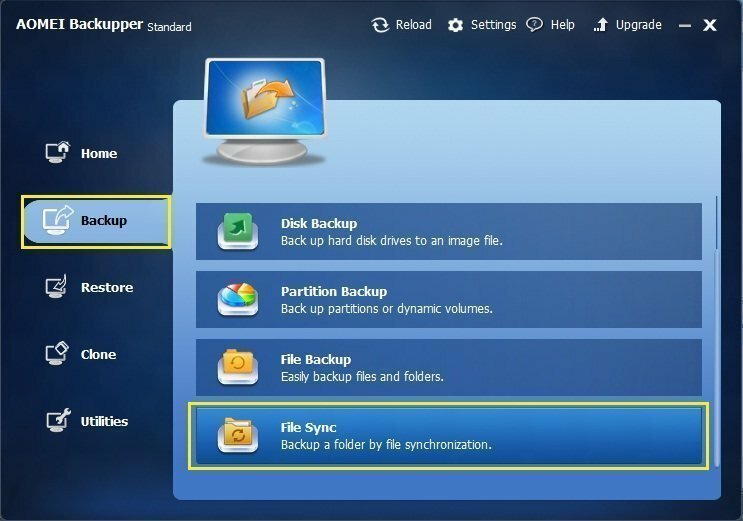 It can not only synchronize folders to local disks or devices, but also synchronize folders to other computers by LAN/NAS. 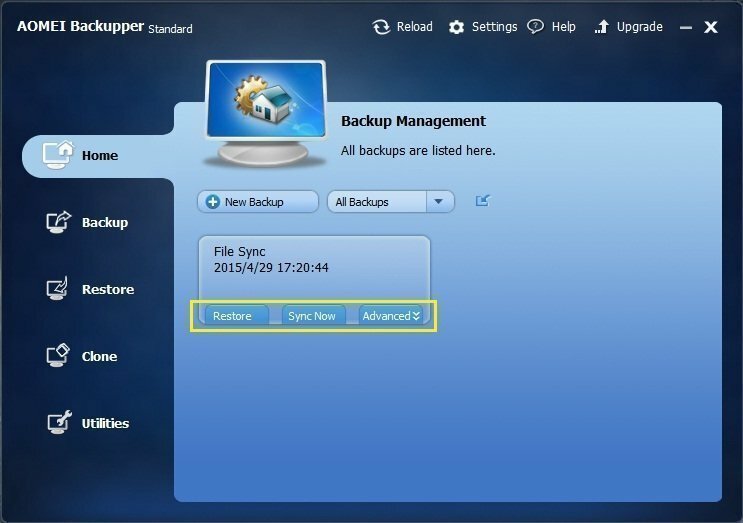 How to Sync Files with AOMEI Backupper Standard? AOMEI Backupper Standard added “File Sync”, which can synchronize files in a simple way. It is better than SyncToy not only because of the strong function but also the operating. It is only need two steps so that you can finish the command. It is not allowed that synchronize the single file more than 4 GB to FAT/FAT32, cause it only supports up to 4 GB single file. It is not allowed that synchronize files or folders to CD/DVD/Blue-Ray. AOMEI Backupper File Sync can only support one-way sync file at present. That is to say, you can synchronize the files from one folder to another folder, but you can’t synchronize the files from the later one to the former one. Download AOMEI Backupper Standard free, install and launch it. Step1. Click the “Backup” and select “File Sync” by sliding the scrollbar as the following picture. Step2. 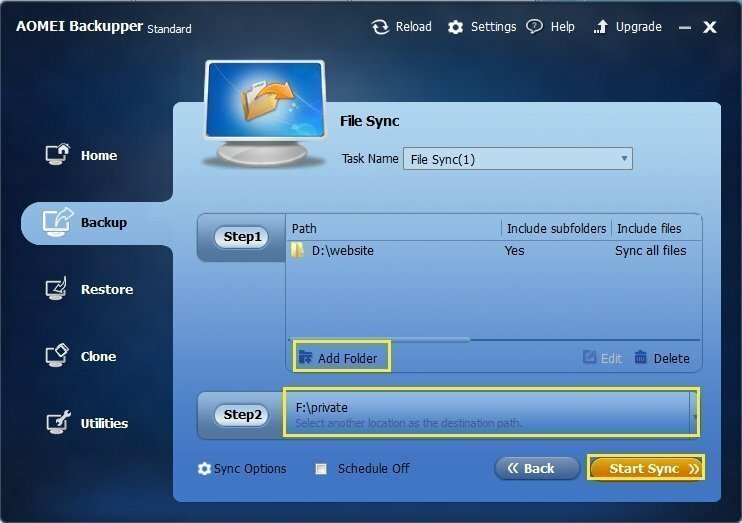 After opening the “File Sync”, you can choose the sync files you would like by clicking “Add Folder” in step1 at the interface and select another location for the destination path in step2. What’s more, you can click the “Sync Options” to set up the specific sync file requirements. It includes comments and notification. Click the “Schedule Off” can set up schedule sync file about daily, weekly, monthly and event triggers. Then, click “Start Sync”. Thus, you have finished sync files. After finished the sync, you can go back to the “Home” tab to set up more tasks by using the “Restore”, “Sync Now”, “Advanced”. The “Restore” can restore all the sync files to the source folder or other folder. “Sync Now” seems more like a manual sync. If you didn’t set up schedule sync, you can use it to make up. “Advanced” has many functions, for example, “Open Sync” can check the sync folder; “Delete Sync” can give up the sync file task; “Properties” contains all the information of the sync file. AOMEI Backupper File Sync is the best free SyncToy alternative. If you have any question about AOMEI Backupper File Sync, please visit FAQ about AOMEI File Sync.